Or Episode 46 which uses two photographs (both taken without a tripod) align them up and then uses the mask to remove cars and a person down to their sneakers. The other podcast I found recently is called screencasters.heathenx.org and gives tutorials on how to use the vector drawing tool Inkscape, it's just fantastic. For example, Episode 50 shows how to make an attractive button with a very nice 3d look with reflection and a sparkle effect. Episode 58 was even more interesting showing the new Filter Effects in Inkscape. I didn't know this existed, and it looks very useful. Episode 61 he drew a garbage can and make it look 3d. 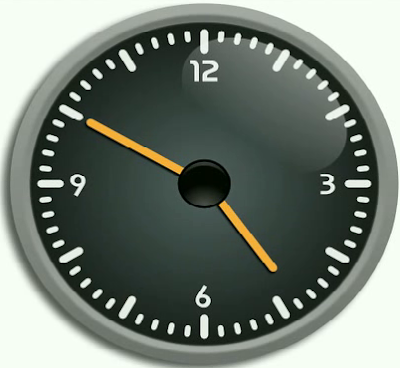 And in Episode 47 shows how to make this rather nice clock using the clone tool.